Rosenborg Castle Garden (also known as King’s Garden) is Denmark’s oldest royal green space, established in the early 1600s by King Christian IV. 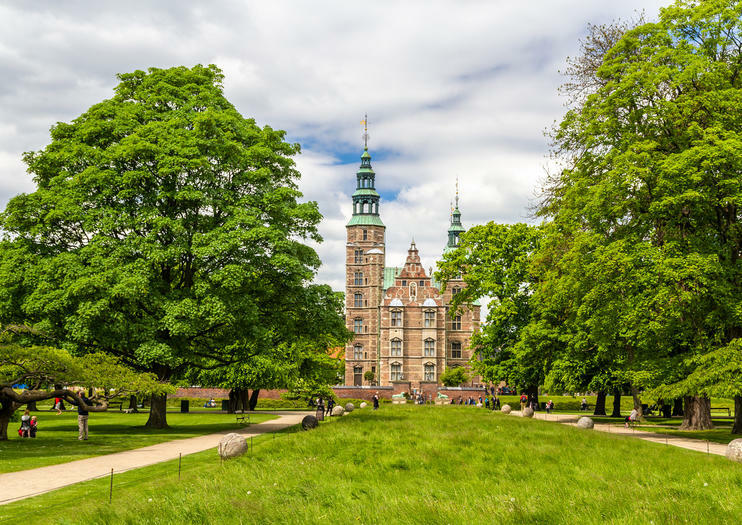 Today the Renaissance-style park—famous for its huge flower beds, hedges, and adjacent eponymous castle—is a popular retreat for Copenhagen locals and tourists alike. Rosenborg Garden is one of Copenhagen’s most famous parks, frequented by roughly 2.5 million people each year. Here you will find the neoclassical Hercules Pavillion, the iconic statue of Danish author Hans Christian Andersen, a rose garden, a symmetrical Renaissance garden, and numerous sculptures. Families with kids enjoy the park’s artistic adventure playground, while travelers of all ages stroll the grounds, sunbathe, and picnic on spacious green lawns. Visit on a hop-on hop-off bus tour to explore King’s Garden at your own pace, or see the park on a cultural walking tour of Copenhagen to benefit from the knowledge of an experienced guide. If you who want to visit Rosenborg Castle (Rosenborg Slot), located adjacent to the garden, you get free entrance with a Copenhagen Card. Rosenborg Garden is a perfect retreat from the bustling city center—head there for a picnic lunch between sightseeing visits. Entrance to the garden is free, but tickets are required to see Rosenborg Castle. The King’s Garden contains a café, located in the Hercules Pavilion. All garden paths are accessible to wheelchairs and strollers. Rosenborg Garden is located in central Copenhagen and is easily accessible on foot, by bike, or by public transportation. Several buses stop at the garden, and the nearest metro station is Nørreport St. The King’s Garden is open year-round. Summer is the best time to visit, when temperatures are warm, the flower beds are blooming, and the lawns can be crowded with sunbathers. The park hosts a puppet show for children in midsummer, and several bands perform in the garden during the Copenhagen Jazz Festival in July. A trip to King’s Garden isn’t complete without a visit to the adjacent 17th-century Rosenborg Castle, home of the Danish crown jewels and the famous Knight’s Hall, where three life-size silver lions stand guard over the coronation throne. Other castle highlights include one of the world’s finest Venetian glass collections, portraits of Johann Friedrich Struensee and Queen Caroline Mathilde, and an extensive collection of royal regalia. Find your bearings in a new city and enjoy an immersive experience of Copenhagen as you stroll its streets on a private walking tour. Benefit from a flexible itinerary to visit landmarks such as the Little Mermaid, Christiansborg, and the Rundetaarn, gaining insight into the city’s history and culture along the way from your personal guide.